It’s no secret, exercise is essential for a healthy body and mind. 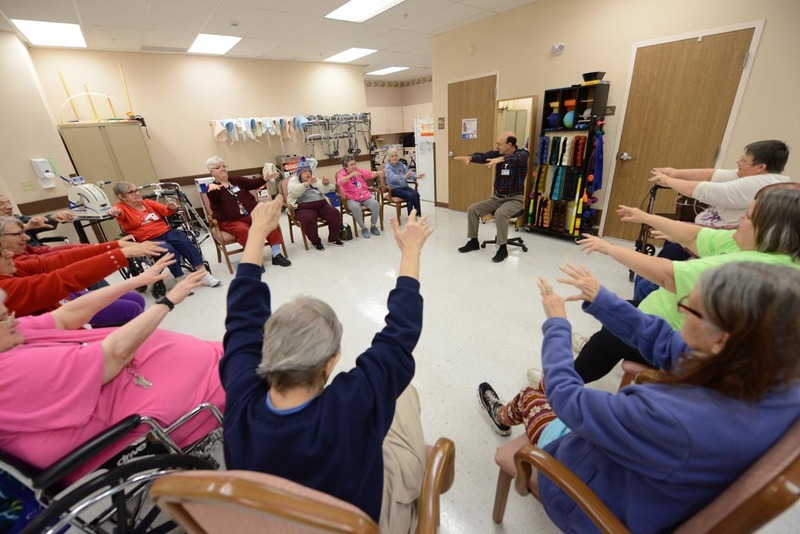 Exercise for older adults can be a challenge, however, when mobility is an issue. But that doesn’t mean that exercise is any less important. The key is staying active and moving the body in any way possible. As our bodies age, we tend to encounter more health issues from both inherited conditions and poor lifestyle choices. Exercising helps to slow the progression of many diseases and can even slow the aging process. Studies have shown that older adults, those age 55+, who have been active for most of their lives actually have the similar aerobic fitness of people 30 years younger than them. For older adults who have not been able to stay active their whole life, it’s not too late to start. Starting now will help not just in the long-term, but there are also plenty of short-term benefits to exercise for older adults. Some short-term benefits include improved mood, healthier looking skin, and lower stress, just to name a few. Exercise is essential in managing many long-term health conditions such as heart disease, diabetes, asthma, or back or joint pain. For example, exercise can help improve high blood pressure and can lower your risk of heart disease progression. What Types of Exercise for Older Adults is Best? Any personal fitness trainer will tell you that the best exercise plan includes a mix of cardio, strength training and flexibility. This recommendation is no different for seniors. However, as we age, managing to do these types of exercises consistently can become a challenge, but it is not impossible. The key to it all is to move and keep moving. -Aerobic exercises (cardio) can improve heart health, endurance, and weight management. And aerobic exercise does not have to complicated. Simply walking at brisk pace for 20 minutes is enough to be considered aerobic exercise. -Stength training can improve muscle strength, tone, and make it easier to perform everyday tasks like climbing the stairs or lifting a laundry basket. -Flexibility exercises can improve your range of motion and help reduce the risk of falls. If you or a loved one have a hard time getting out of a chair or have a hard time walking, you do have options. A simple internet search for “chair exercises” brings up a host of exercise options that can be completed, all from the comfort of your Barcalounger. For example, seated leg lifts can be a strength building exercise. Pick up the tempo of your leg lifts and the exercise quickly becomes cardio. How Often Should Older Adults Exercise? The benefits of exercise are compounding, meaning that the more you perform exercise, the better the results. In general, most professionals recommend at least 30 minutes of physical activity, five days a week. If this seems like too much for you, start off slow with perhaps 10 minutes a day and work your way up to 30 minutes over time. This will give your body plenty of time to adjust to the new regimen. Before you begin your exercise regimen or try something new, always consult with your doctor, especially if you have preexisting health conditions. Your doctor can help you get started with exercise in a way that safest and healthiest for you. If you are 55 years or older, are Medicaid eligible, and live in a service area, the Senior LIFE Program could help you to stay fit. The LIFE Program provides all medical and supportive services you need to continue to live at home and out of nursing facility. These services include access to therapy and the LIFE Health and Wellness Center gym. What is even better is that there is no limit on the amount of therapy you can receive and all members have access to the gym. For more information on the Senior LIFE Program, please visit our website: www.seniorlifepa.com or call us directly at 1-877-998-LIFE (5433).